• According to World Bank, 32.7% of the total Indian population falls below the international poverty line of US $1.25 per day (PPP) while 68.7% live on less than US $2 a day. • Major causes of poverty are high level of illiteracy which results in high unemployment, high inflation rate, unequal disbursement of wealth, inadequate health care, and limited access to social services provided by government. • Out of 26 million children born in India every year, 2 million do not survive to celebrate their first birthday. About 43% of children under the age of five years are malnourished. 31% of infants are born with low birth-weight. More than half of all pregnancy women aged between 15 and 49 years suffer from anemia, which is the main cause behind children born with birth defects and disability. About 20 million children, which are about 4% of the population, are orphan in India. Poverty has been a significant reason behind increasing number of orphan population. Click Here to spread a smile. Support people living in poverty; Help them fight poverty, hunger and disease. • There are over 70 million disabled people in India, which is about 6% of the population. This figure is larger than the entire population of the United Kingdom. 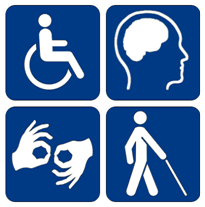 • The Persons with Disabilities Act 1995 defines disability as one or more of the following: Visually Impaired or Blindness, Hearing Impaired or Deaf, Mental Retarded or Mental Illness, Orthopedically Handicapped, Multi-Handicapped, Leprosy, Locomotors Disability, or Palsy-stricken people. Disabled people experience unequal access to education. Also, there is a serious lack of quality vocational training. Hence, they are unable to reach their potential, and remain dependent on families for support. Disability is believed to be social phenomenon – It is the society we live in that disables people more, by failing to recognize, socially marginalizing, underestimating and teasing them. Often, disabled people say that they feel they are seen as useless, looked down upon, and treated as objects. Click Here to spread a smile. Make them socially and financially self-reliant, and Enable them to live a life with dignity. • Child population of India is about 440 million. Out of those 440 million, children who should be receiving primary education, 23% don´t even attend school. • More than 50 per cent of girls fail to enroll in school; those that do are likely to drop out by the age of 12. • One out of two children between the ages of 6 and 14 has no access to primary education. • In nearly 60% of schools, there are less than two teachers to teach Classes I to V.
Disclaimer: - Source of the above content is through Internet Research, Online Articles & Publications from various published websites.